Dog Easter Bunny Costume XS size Warm fleece material Would suit small dog like chihuahua or a puppy Measures 30cm around the chest and 20cm in length Any questions are welcome! Rosewood Winter Warmer Fleece Festive Themed Dog Christmas Jumper Large 20"
Keep your pet looking stylish whislt being cosy on those long winter walks in this Rosewood Winter Warmer Fleece. Key Benefits: ---Cosy, warm and comfortable ---Snowflake design with hood ---Super Soft and Cuddly ---Velcro neck fastening (to make it easy to put on) ---Lead hole ---Front Leggings ---Perfect for indoor use or outdoors on a dry day. ---With hood and pompom. 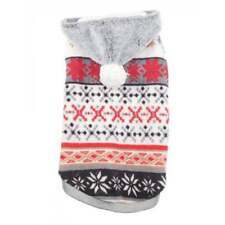 ---Easy to fit by simply placing over the dogs head and placing the front legs through the leggings. To find the correct size for your dog simply measure from the base of the neck to the top (base) of the tail then select the nearest size. Small 34cm Medium 44cm Large 54cm. CUTE DOG PUPPY NAVY BLUE PINK PAW FLEECE JUMPER PYJAMAS TOP CLOTHING - FREE P&P! Dog Christmas Jumper Reindeer XXS size Warm fleece lining Would suit small dog like chihuahua or a puppy Measures 34cm around the chest and 24cm in length Any questions are welcome! CUTE DOG PUPPY CHRISTMAS SNOWMAN FLEECE JUMPER PYJAMAS TOP CLOTHING - FREE P&P! 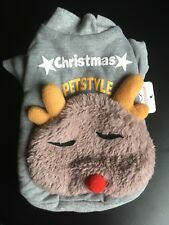 Pet Dog Soft Warm Christmas Reindeer Hoody Jumper with Antlers. Condition is Used. Dispatched with Royal Mail 2nd Class.